The basic principle of lanterns couldn't be simpler - make a light source shine through something so you can see the light come out the other side in a more interesting way. to make a container and modulate the light. Lantern Lab is where we'll experiment with different materials and techniques and let you see the results. Learn from our successes and laugh at our failures! I made a small Pop Bottle Lantern just to see how easy it was and realized once I put my glow stick inside that the colour of the light source could completely change the appearance of the colours. The picture on the left is the lantern lit from outside only. 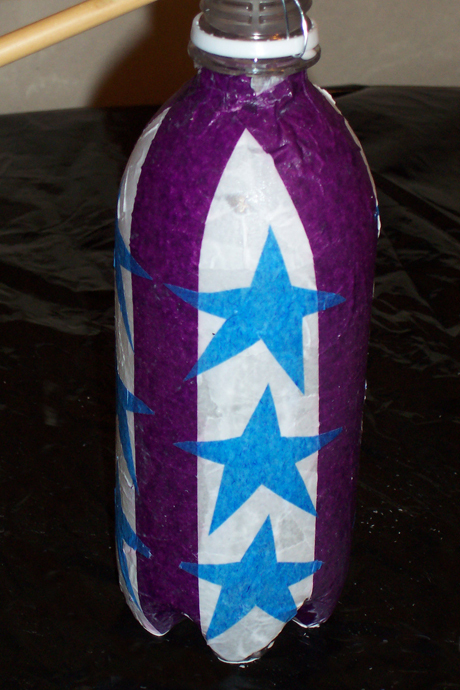 In the centre I'd put a white glow stick inside - the colours are white, with blue stars and purple stripes. Looks good, even though the purple has lost a bit of intensity! On the right, the glow stick was yellow and the resulting lantern colours were yellow with brown stripes and green stars - not really what I had planned. It's a good lesson in colour theory though - try it yourself to see how it changes. While preparing the cans full of ice for the Tin Can Lantern, we discovered that the bottoms of the cans bulged out when the ice was fully frozen, even though the tops were not sealed or even covered. We are trying to find out why this might be the case and what can be done about it. ETA - It was discovered the filling the can in stages and freezing layers of ice works better. In this case, the bottom of the tin did not bulge. An alternative suggestion was to fill the can with sand. This was unsatisfactory - there was not enough resistance to the nail to make it easier to pierce the can and if the can was turned on its side the sand simply ran out. Perhaps this would work for a large container that could be kept upright as the nails were used. Your results may vary - tell us if they do, or check out the forum for more discussions! "How the heck can I get things to stick together? I want to hold my frame together, stick my paper or fabric on it, and keep my candle from falling out! Help me, Lantern Lab!" "Olive oil works really well in my little oil lamp. Will it work in a lantern? Isn't it messy? I don't know! Help me, Lantern Lab!" 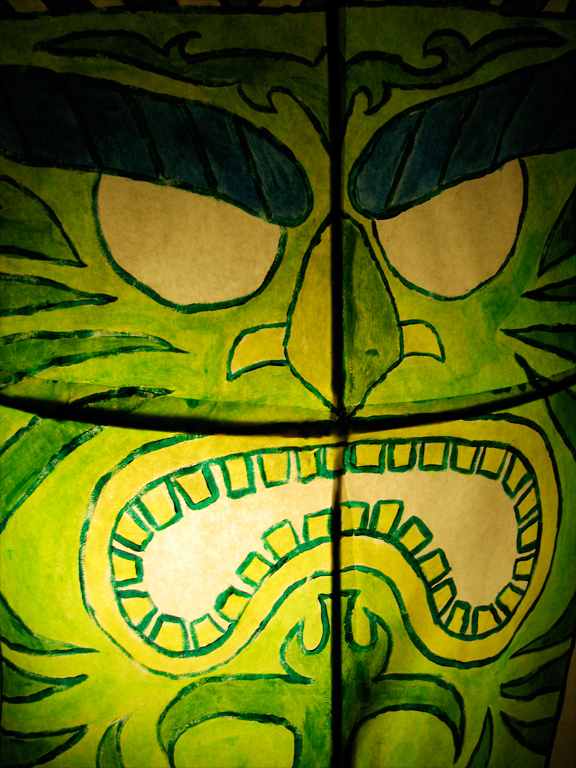 This lantern is made with kozuke paper on a basket reed frame. The image is painted with acrylic thinned with acrylic medium.